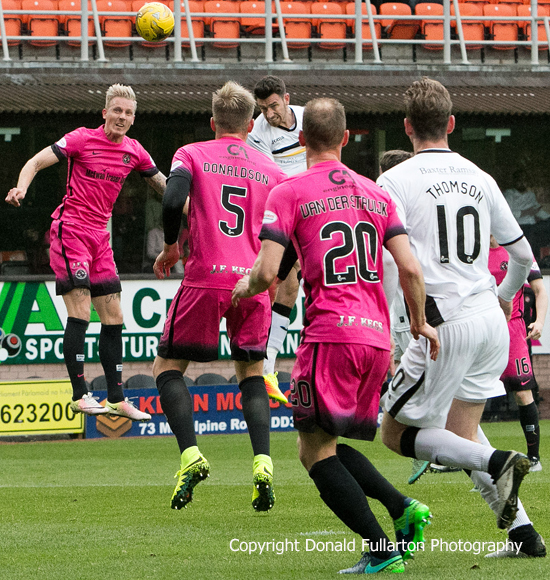 DUMBARTON produced a much improved performance but lost 2-1 to Dundee United at Tannadice. DUMBARTON produced a much improved performance but lost 2-1 to Dundee United in front of a 6,000 crowd at Tannadice. With a year since their last away league victory, Sons could have won this clash and certainly deserved a draw. There were opportunities for both sides in a busy first half. United hit the post early on, while Sons forced home keeper Cammy Bell into some great saves. The match remained deadlocked until 52 minutes, when a corner from United was headed into his own net by Mark Docherty. It was bad luck and not what Dumbarton deserved. On 65 minutes the Ry McKinnon's men went 2-0 in front, when giant French defender William Emery Edjenguélé converted from close range after Sons keeper Alan Martin had made a a good save from a corner. Robert Thomson gave Dumbarton hope on 71 minutes, knocking the ball home from close range after Bell saved an Andy Stirling shot. Minutes later Sam Stanton was barged off his stride by Coll Donaldson as he burst into the box in search of an equaliser, but no free kick was awarded. Gregor Buchanan is pictured heading for goal.